The idea of using a thin client isn’t exactly new and their appearance is mainly related to the desire to cut costs on IT-infrastructure itself and its support. So, what is a thin client about and how does it work? A thin client uses client-server architecture in full and is in essence a primitive terminal client used only for information input and display whereas all major processing is performed on a server. Very often the power of modern PCs remains idle when they’re used by secretaries who have to perform routine tasks with databases and catalogues, or as teller terminal, gambling machines, etc. Besides, hardware gets outdated very soon and the whole park of machines has to be constantly updated; also installing and supporting ordinary PCs by IT-specialists is very time-consuming. All these problems can be almost totally avoided by using thin clients which substantially reduce costs of a workplace and simplify support. Also we should keep in mind reduced power consumption. However, let’s pass from words to deeds: today in our testing lab we have an NComputing L300 thin client model to the detailed review of which we will now be turning. 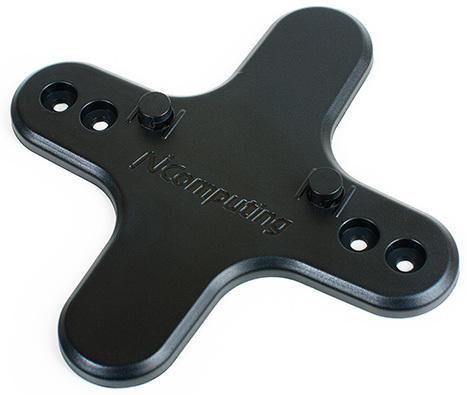 NComputing L300 is performed in a black parallelepiped case with rounded corners and one sloping edge. 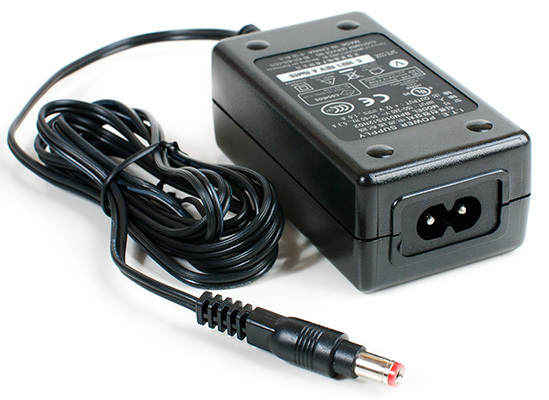 The dimensions are 115*115*30 mm and for its work the device demands an external power adaptor and 1 A DC at 12 V voltage. The mass of the device without the power adapter is only 154 g.
The L300 upper surface has a three-dimensional vendor’s logo. On the sloping edge there are three light indicators: power, activity and network link. Two sides are quite featureless except for the vendor’s company name. Two other sides have ports for the power adaptor (together with the switch), for a VGA monitor, a network connection, USB-devices as well as speakers and a microphone. It’s worth noting that a keyboard and a mouse are supposed to be connected to two specific ports whereas two other ports are assigned to faster devices. On the thin client’s bottom there’re four rubber stands and technological holes for mounting it on a special rack (included in the set) put on the monitor. Also on the bottom is a ventilation grate, a sticker with brief information about the device and a hologram. Now let’s look inside L300. 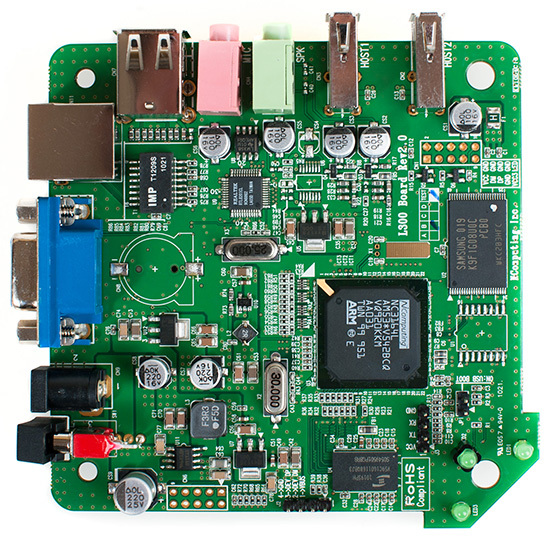 The insides of the thin client are represented by one green textolite board (L300 Board rev2.0) the main elements of which are placed on one side. An NC3164L chip serves as an ARM-processor. 128 Mbytes of flash are provided by a Samsung chip. There’re 128 Mbytes of RAM too for which a ProMOS V59C1G01168QBJ3 chip is used. Network connections are supported by Realtek RTL8201CL. Now let’s turn to L300 program features. 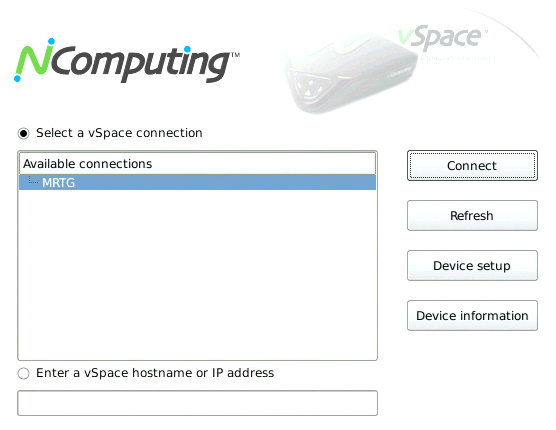 L300’s work is impossible without connecting to a server with pre-installed vSpace software; so before starting up with the thin client you have to prepare the server and install a fresh version of the software on it. 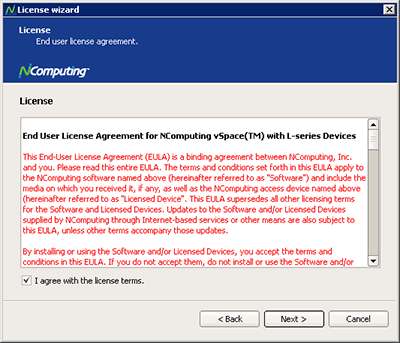 During the installation process the user has to approve of the OS’s installing several NComputing components. Unfortunately, not all antivirus products are OK with the installation of vSpace. We encountered some problems with vSpace and Kaspersky Internet Security 2011 working together; that’s why the vendor recommends a certain sequence of installing software which we show below. 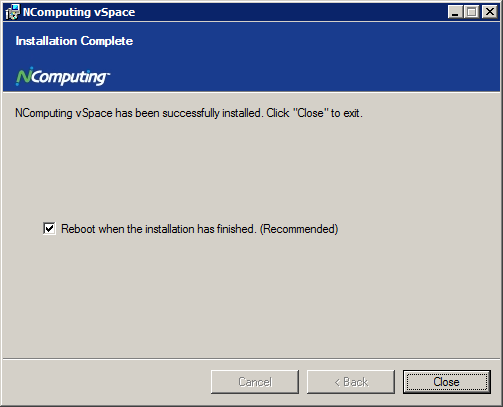 When vSpace installation is complete the operating system has to be rebooted. 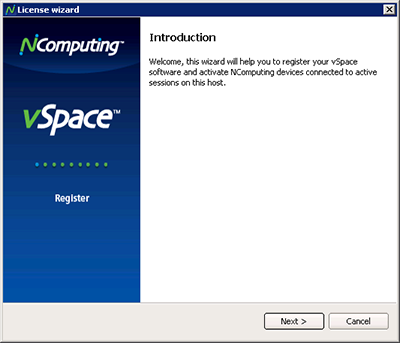 VSpace server software must be registered before you start using the NComputing L300 access device. Registration is possible on the internet or offline. The registration process is very simple and won’t take a lot of administrator’s time. After successful vSpace registration you only have to prepare the thin client itself; for this put L300 in a convenient place, connect all necessary cables and turn the device on. 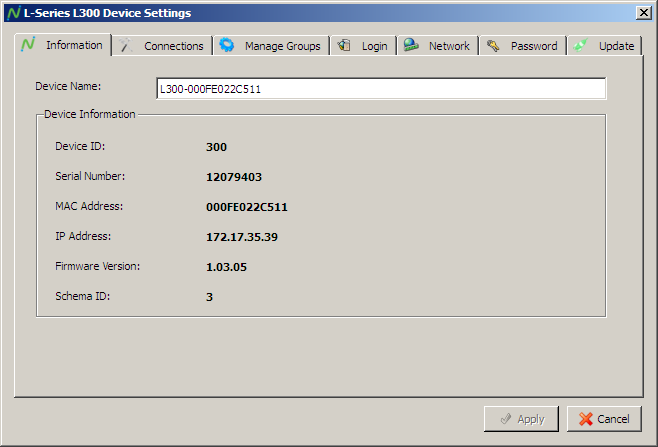 If the local network segment uses DHCP, L300 will automatically receive all network settings and you will only have to choose or specify a server for the connection. If DHCP isn’t used, the administrator will have to manually specify the terminal client’s IP-address, the subnet mask, the gateway as well as the DNS-servers’ addresses and only then choose the server. Here we finish the necessary preparatory stage. Now let’s upgrade L300 firmware. 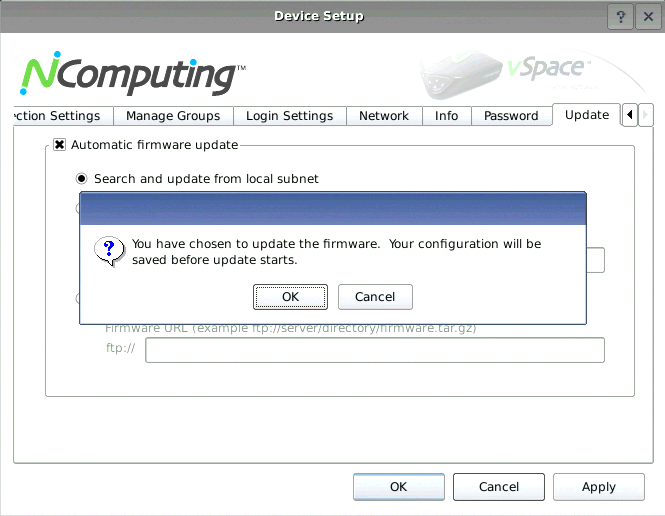 One can start upgrading L300 firmware from the device itself or remotely with the help of a console that is part of vSpace software. Let’s look at both options. For upgrading from the terminal you have to turn to its settings and go to the Update tab. 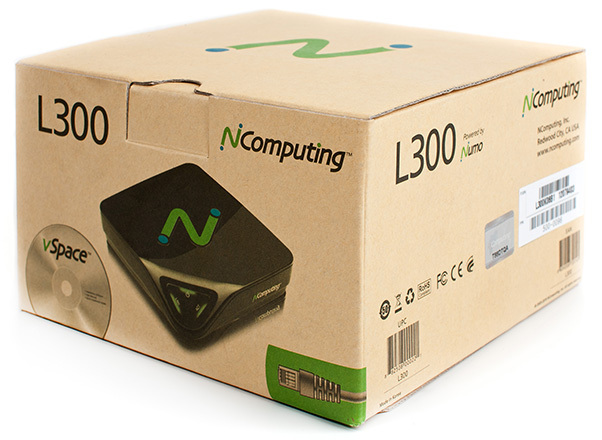 NComputing L300 can be upgraded automatically while booting or manually. 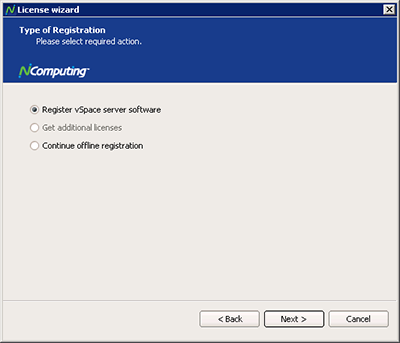 Normally, nothing except a connection to a server with vSpace software is required for the update; however, L300 permits updating from an FTP server as well. As we got a thin client with an outdated firmware version, we decided to move to updating it straightaway as it was already part of vSpace. We clicked the Update Now button, backed up the current configuration of the device and moved to firmware upgrade itself. The whole upgrade process is performed automatically and only takes a few minutes. Straight after the firmware upgrade L300 is fully operational. 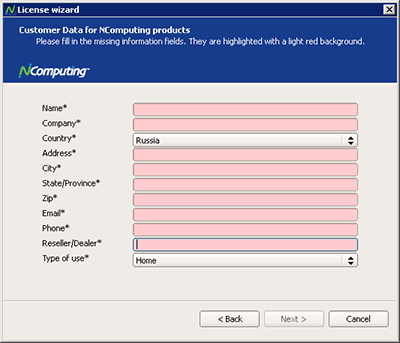 The same result can be achieved with the help of both versions of the NComputing console. Now let’s study L300 interface. After powering up L300 goes through an initiation procedure and a search of available servers with pre-installed vSpace software. If the addresses in the local net are assigned automatically with the help of DHCP, the device will receive all network settings and will be ready to work. Otherwise you’ll have to make some additional configuration. 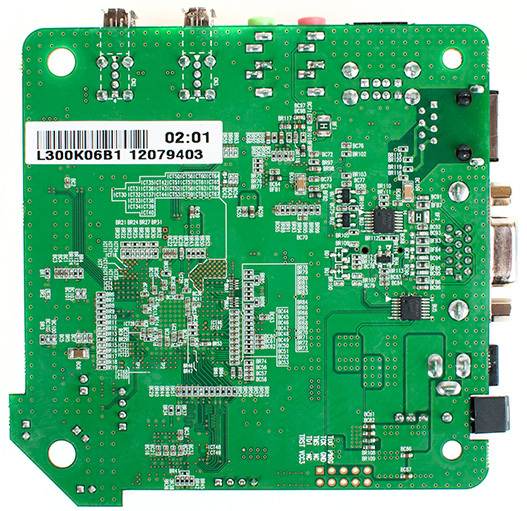 L300 interface is only available in English. 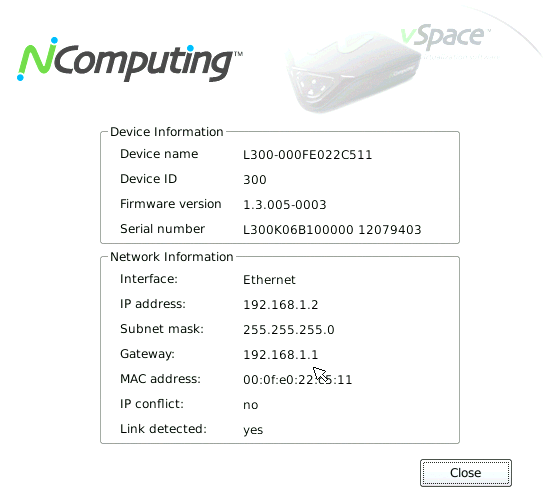 When vSpace servers are detected information about them will be displayed to the user in the Available connections field of the terminal’s main window. Connection is possible not only to the detected servers but to those specified manually as well. The user can get brief information about the thin client after clicking the Device information button. L300 settings are hidden under the Device Setup button and are distributed among six tabs which we’re now going to study. 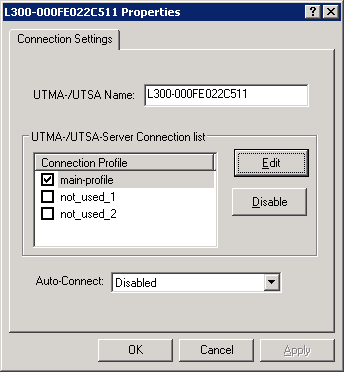 On the Connection Settings tab the administrator can set if the client should automatically connect to the terminal server or connect it manually. 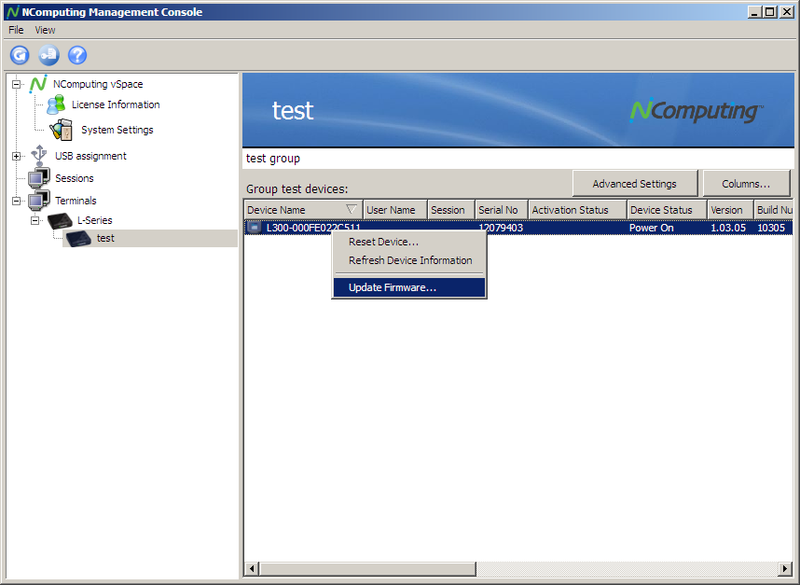 If automatic connection to the group is chosen, first the client tries to connect to the first server and if fails, then tries the second, the third, etc. When the end of the group is reached L300 tries to connect to the first server again. The described scheme is used for servers’ redundancy. 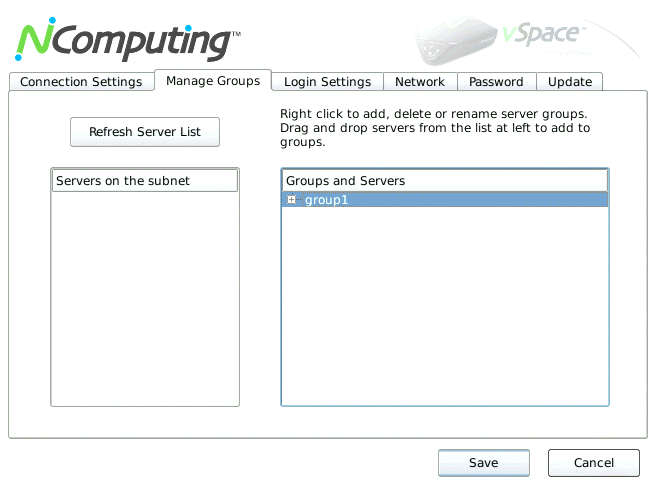 Servers can be combined into groups on the Manage Groups tab. With the help of the Login Settings tab the administrator can choose the screen resolution, the color depth, set idle time before going to sleep and also to set the login and password for automatic login into the system. The supported resolutions vary between the minimum 640*480 to 1920*1080 with the color depth 16 or 24 bit. If NComputing L300 is used in ATMs, terminals or for some informational purposes, then a corresponding program can be started instead of the traditional login. 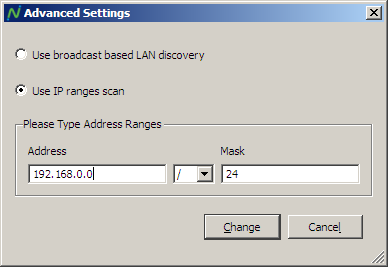 The Network tab serves for changing network settings; there the user can configure the IP-address, the subnet mask and the name of the device itself as well as specify the default gateway address and DNS-servers if all these parameters can’t be automatically received via DHCP. 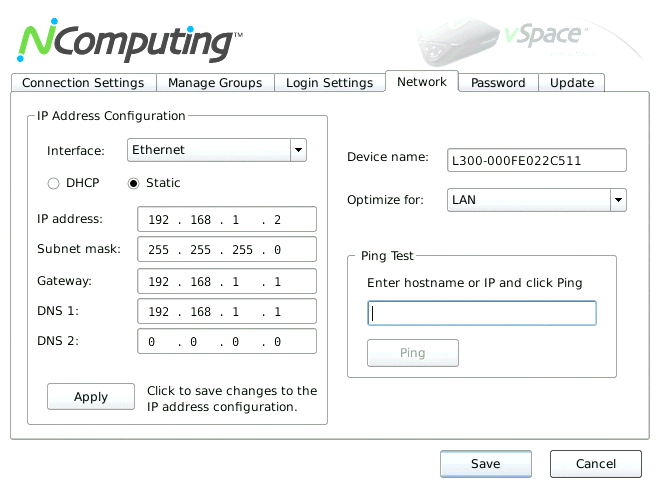 Beside the described settings, on this tab you can run a ping test of the net by sending ICMP echo-requests. Access to L300 settings can be restricted with the help of a password that is entered on the Password tab. 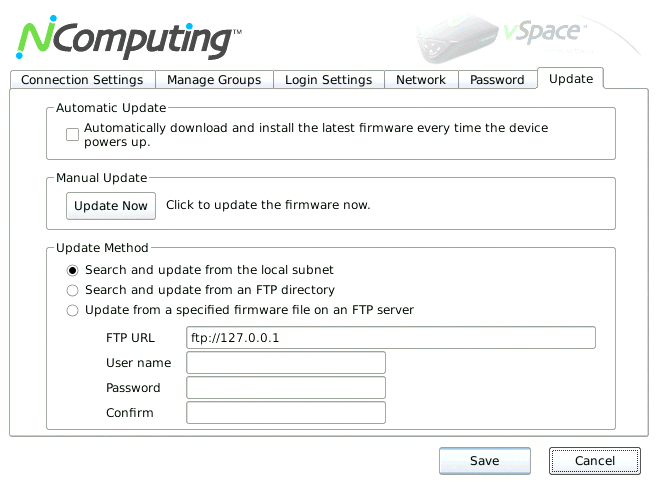 The Update tab is for firmware upgrade about which we spoke in the corresponding section. 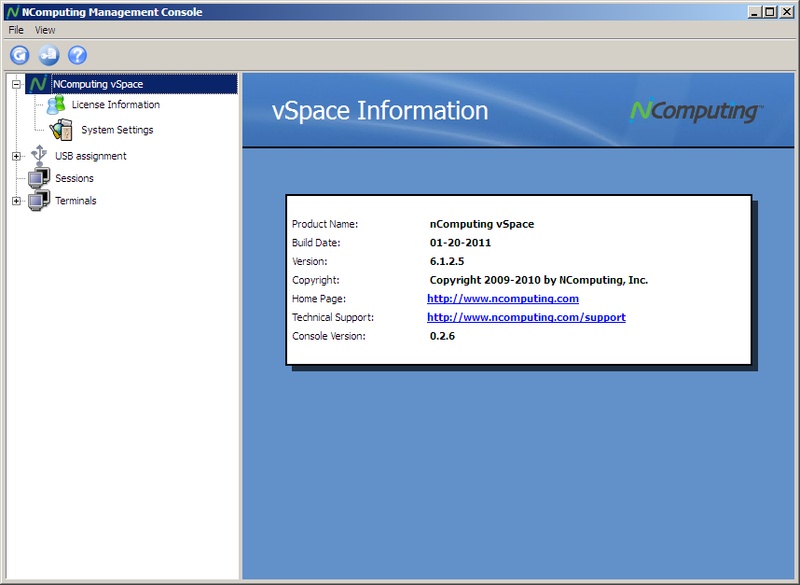 Now let’s look at the abilities of the NComputing vSpace administration console. When the article was being written, there were two versions of vSpace software: 4.9.4.8 and 6.1.2.5 (for x64 systems) whose administration consoles differ a lot. Let’s briefly review the features of both of them. 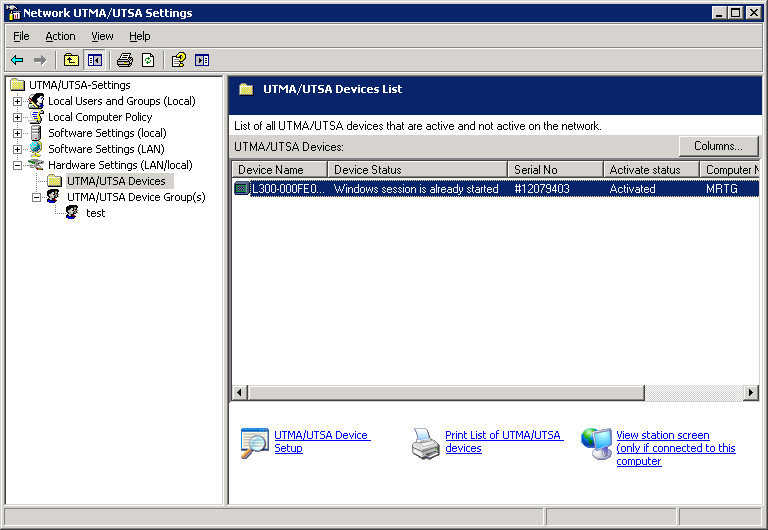 The maximum number of settings is available to the user in the fourth vSpace version also called Network UTMA (Ultra Thin Multi Access)/UTSA (Ultra Thin Station Access) Settings. The first two menu groups Local Users and Groups (Local) and Local Computer Policy are standard and are part of Computer Management and Local Computer Policy snap-ins. 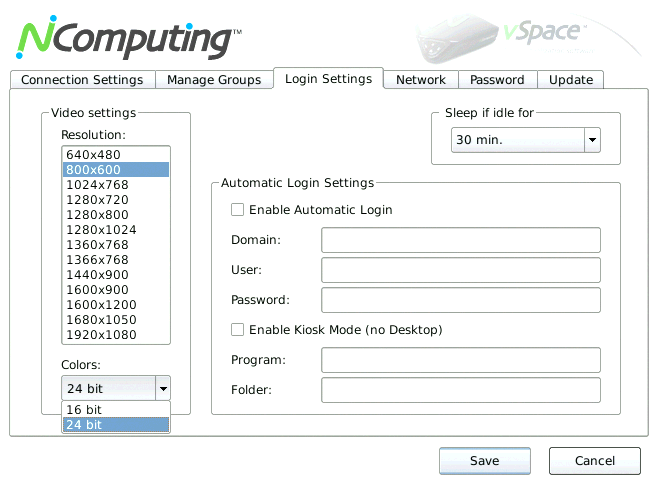 The third group Software Settings (local) allows the administrator to get information about the vSpace version on the current server and its settings, accessibility of USB-devices and about thin clients’ active sessions and running applications. 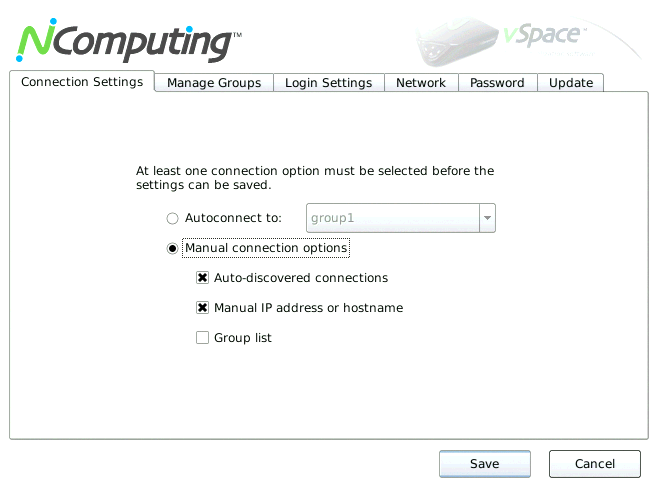 The Software Settings (LAN) group gives the same opportunities as Software Settings (local), but also allows configuring other servers with pre-installed vSpace software. 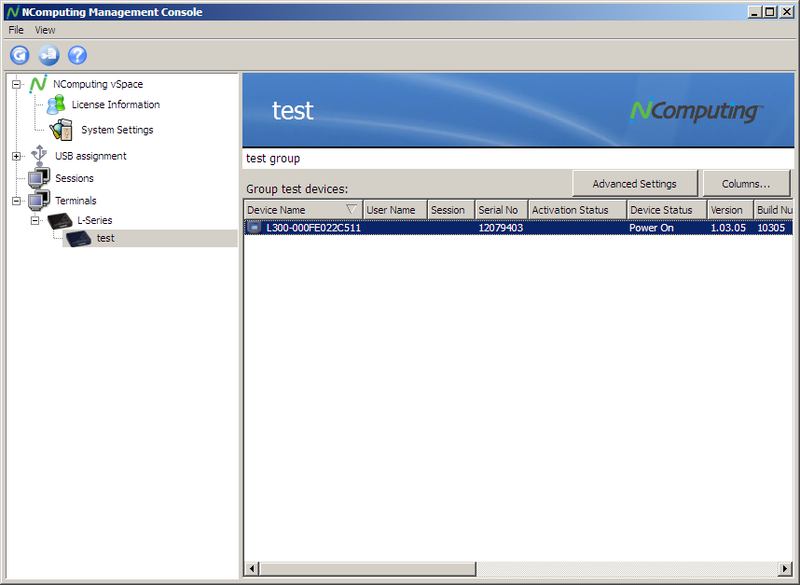 Scanning and management of all connected thin clients can be done in the last menu group Hardware Settings (LAN/local) displaying the devices themselves and their logical groups. 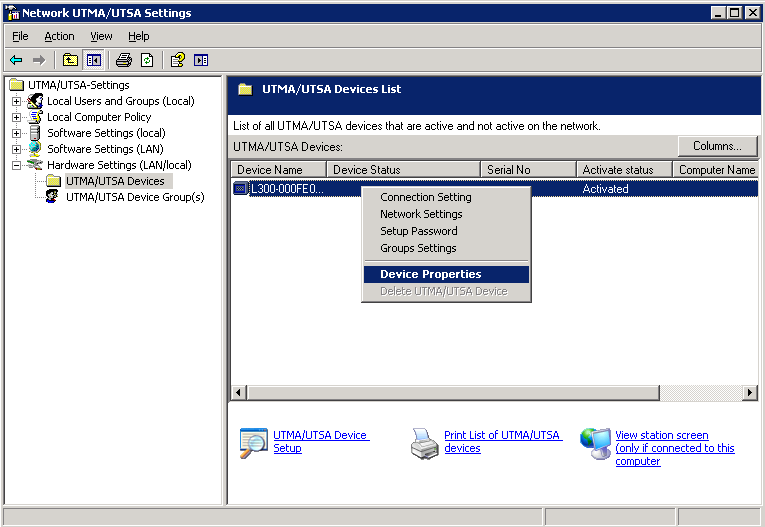 For each of the connected devices the administrator can review and change the device parameters, its firmware and network settings, set a password, choose the interface language and configure profiles. Unfortunately, so far it’s only possible to work in English. One of the most interesting features is the ability to view the thin client screen; in this case the remote user gets a corresponding warning. 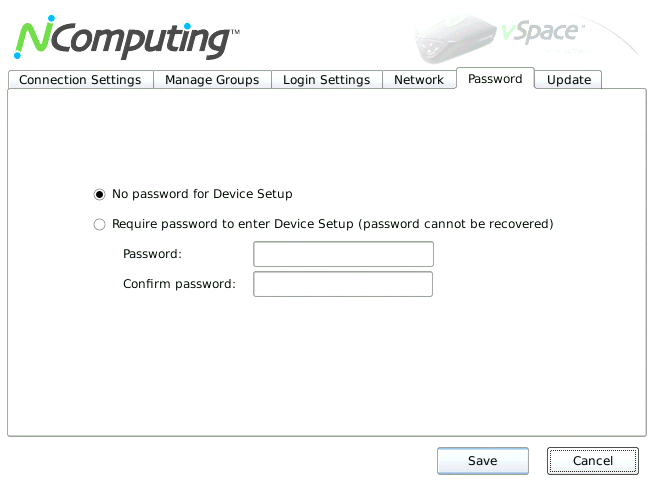 Unfortunately, vSpace only allows observing the screen; the administrator can’t manage input-output devices of the client’s session. 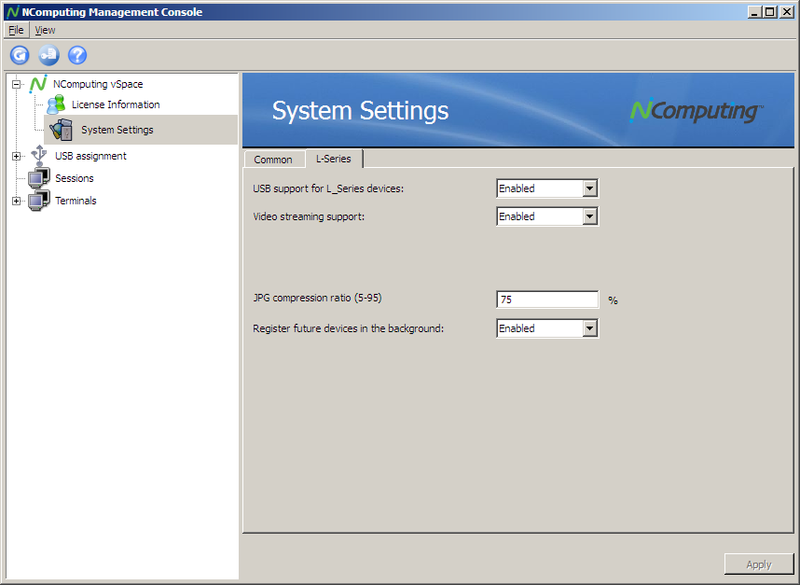 Now let’s look at the NC-console provided with the sixth product version and containing the following menu items: NComputing vSpace, USB assignment, Sessions and Terminals. 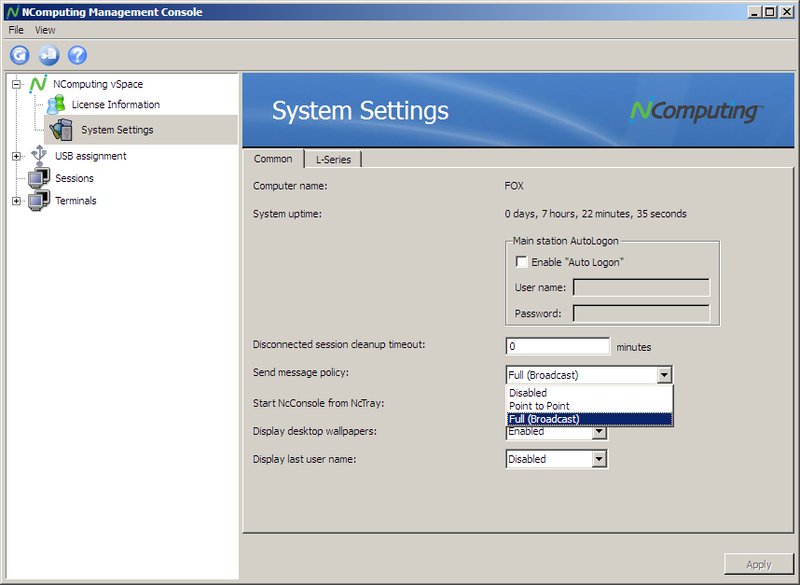 The System Settings sub-item of the NComputing vSpace menu has two tabs: Common and L-Series. With the help of the Common tab the administrator can see the system uptime, allow terminal users’ automatic login with a specified login and password, limit the session idle time, choose the terminals’ communication policy and to change other settings. 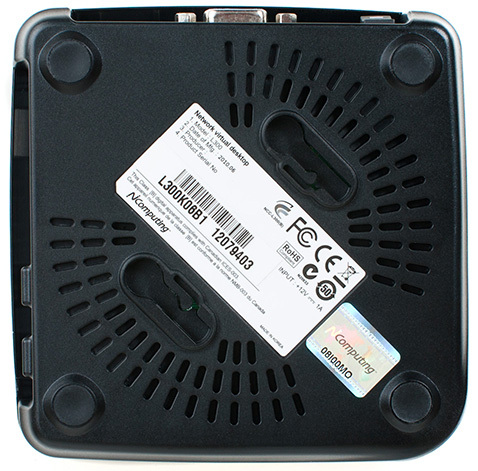 On the L-Series tab one can permit or deny connecting USB-devices to L-300, enable video streaming support, set the JPG compression ratio and let the system register new thin clients in the background mode. 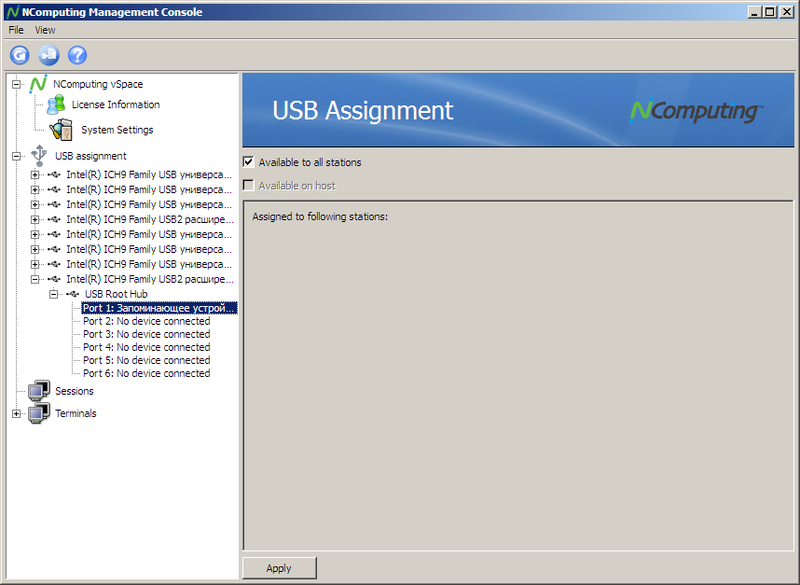 The items of the USB assignment menu allow specifying what USB-devices connected to the server can be available to the terminal clients’ users, while the Session item displays information about the connected remote users. The Terminals item presents data on the NComputing thin clients detected in the net and allows combining them into groups. 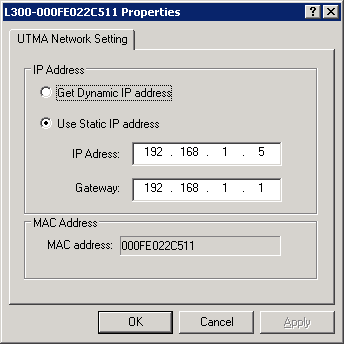 The search for terminal devices can be performed either though broadcasting in the local segment or through successive sending a UDP-datagram to port 1027 to each IP-address in the specified range. For each thin client present on the Terminals menu list it’s possible to change the settings available from the terminal itself for which you’ll have to double-click on the line with the device in question. 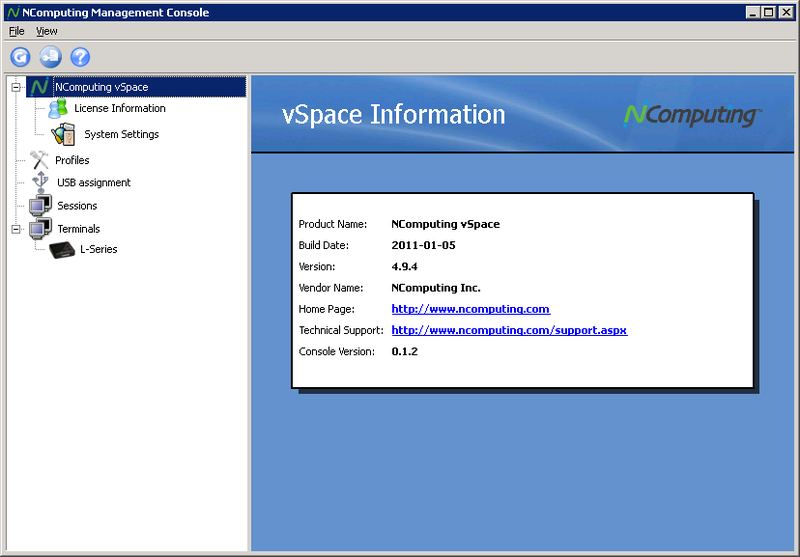 To be fair, it’s worth noting that the NC-console presented in the vSpace sixth version is available to the users of the fourth version. For this one has to run the NCCON.EXE file located in the program folder. Now let’s move to testing the thin client. Our readers must already have a strong association between the beginning of the testing section and determining the device booting time by which we mean the time interval between powering the device up and receiving the first ICMP echo-reply. 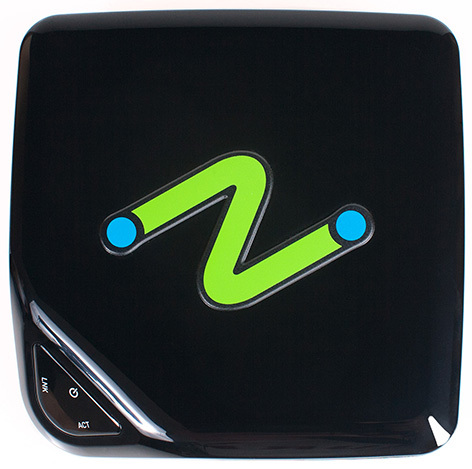 NComputing L300 boots in 32 seconds. We consider this booting time normal. However, it’s worth noting that after 32 seconds L300 isn’t fully operational yet, the thin client needs up to five seconds to search for vSpace servers in the local segment. 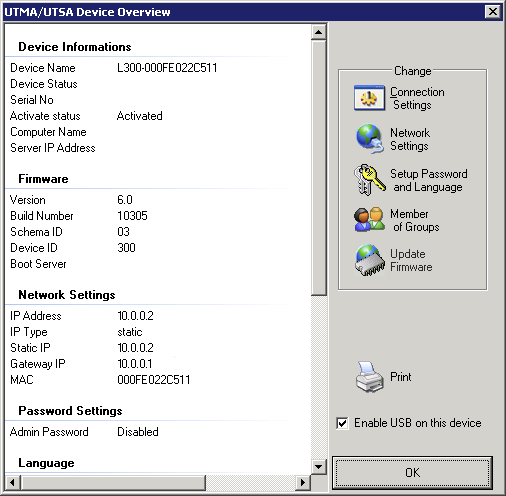 L300 supports two USB-devices (besides a keyboard and mouse) allowing connecting peripherals not to the server but to the thin client itself. Certainly, we couldn’t miss such opportunity and connected an external hard drive to NComputing L300. The main parameters of the test stand are presented in the table below. Despite the fact that the thin client in question has USB 2.0 ports, it became clear from the very beginning that we wouldn’t get the full interface speed because, for one, the connection between the client and the server goes at 100 Mbps whereas USB 2.0 can theoretically reach 480 Mbps. For testing the access speed to the disc we used Intel NASPT 1.7.1. The obtained results are presented below as a table and a diagram. 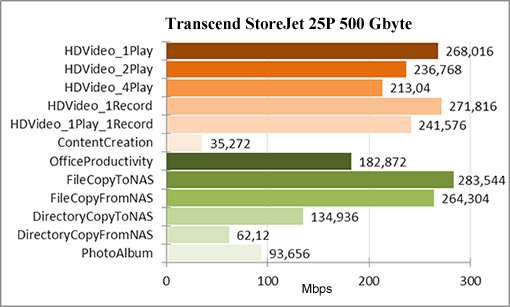 It’s also worth mentioning that the working speeds of the Transcend StoreJet 25P 500 Gbytes disc that we used are considerably higher than the numbers we got. We also present a diagram of the used disc speeds when it’s connected directly to the PC. 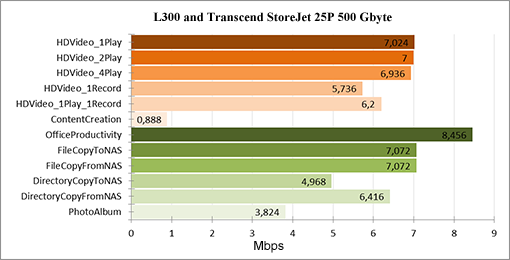 We were very surprised by the obtained results and consider the measured data transfer speeds low for USB-ports. Connecting peripheral devices at such speeds may be needed only for printing receipts and labels or for transferring small amounts of data, as high-speed devices will be practically idle. In all other respects NComputing L300 worked quite faultlessly; the sessions were started quickly and we felt no discomfort working with it. We’d also like to point out that during all tests the maximum temperature of the device surface was 41.2°C. Let’s summarize the results of our tests. The tested thin client NComputing L300 made very a pleasant impression on us as it flawlessly performs its main functions allowing cost cutting on maintaining modern IT-infrastructure. Its advantages are listed below. However we can’t but point at the disadvantages. When the article was being written the NComputing L300 thin client wasn’t sold in Russia yet. The author and the editorial staff would like to thank the Tayle Company for providing the equipment for testing.